Consultant Vascular and General Surgeon Passionate about the NHS! This holiday weekend makes us reflect on religion, family and the world at large. Yesterday, we watched an amazing programme by David Attenborough, which was a ‘call to arms’ to the world to slow down climate change. The risk of global warming within the next 30 years seems inevitable unless we change our own carbon footprints as well as those of major industries. A small rise in temperature may completely change coastal communities as well as drowning historical sites and London itself will be under threat as water levels rise. We have seen the odd swings in local temperatures with huge surges in rainfall which overwhelm local drains. 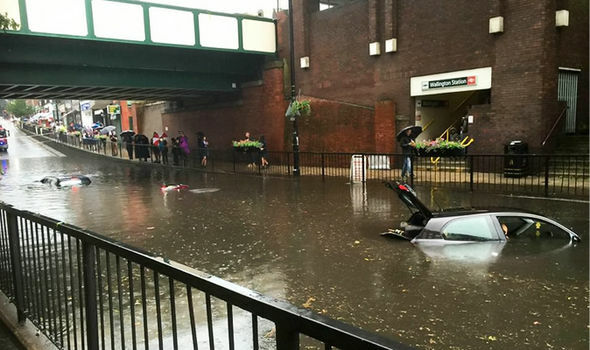 Wallington in Surrey, saw flash floods that caused chaos within a few hours. London is under a greater threat and this is becoming increasingly visible. There are a row of large lions’ heads, cast in bronze, that line the side of Victoria Embankment. They were sculpted by Timothy Butler for Sir Joseph Bazalgette’s Victorian sewage works programme in 1868-70. These are important as they allow a visual guide to the risk of flooding in London. The old rhyme states: “When the lions drink, London will sink. When it’s up to their manes, we’ll go down the drains.” The mouth of each lion holds a mooring ring and the rhyme suggests that if the lions drink the water from the Thames, London will flood. Although the lions have never been submerged to date, certainly high tides now seem to lap the heads regularly. This makes us all consider how we #ChangeTheNorm. The world is changing around us. We are all living longer and expecting more from life. I want my children to enjoy their lives and look forward to their children achieving and living happily and successfully. Stratton and Scott suggest that an individual aged 20 now has a 90% chance of living to 103 in the Western World. Someone who is 7, is likely to live to 107! Authority is being turned on its head. It is humbling that 16-year-old climate activist Greta Thunberg is leading the charge to ‘wake up the adults’ to what is threatening their future. “We had everything we could ever wish for… now we probably don’t even have a future anymore.” She also says the planet’s future “was sold so that a small number of people could make unimaginable amounts of money”. So what do we need to do to? Small changes will make a difference. It is easy to order on Amazon and get a delivery today. It is convenient but does it really matter. Why can’t it wait until tomorrow? Or next month? I think back to the time when we were little. Asian food was not sold in North Wales and we would wait til the monthly trip to Manchester to buy the groceries from the Indian shops there. Now all the food from the world is available in my local superstore. Previously we would enjoy the fruits of the season and now we enjoy them all year round. But do we? How many times does fruit over ripen in the fruit basket and then get thrown out. We all need to consider what we want from life. We have become impatient. We will watch an entire box set or chomp through a box of chocolates because there are no more boundaries on life. Rules that existed previously have been over written. Perhaps now is time to rewrite the rules. There will have to be an exchange of values as we no longer live in an altruistic world. If we suggested that you stop buying online, it would never happen. What would be valuable is to attribute a carbon footprint cost to everything we buy. You may have a choice to buy strawberries. Choice should no longer just be based on cost. One carton maybe slightly more expensive but is produced locally whilst the other has been flown across the world. An understanding of the carbon footprint might alter your choice and start to change the way that we live and eat. Are we able to repair items and make them last longer rather than throw them out and buy new? Do we really need that new phone just because it is the new release? Should Amazon offer a discount if you agree to a bulk delivery once per month rather than the delivery of an item under £5? We all have to #ChangeTheNorm for many reasons. I reflect back on the last few years with regard to my health. I developed a loss of balance and tiredness nearly three years ago and struggled to understand why. I still remember the fear of the diagnosis of an acoustic neuroma and the desperation to stop being a patient and live my normal life. I remember the amazing team that looked after me in the John Radcliffe in Oxford. Mr Richard Kerr was my NeuroSurgeon and operated on me for 12 hours. The night in ITU is unforgettable and I have never felt so vulnerable and weak as in those first five days. Headaches, nausea, dizziness and sheer frustration began and have never completely resolved but are so much better than at the start. In truth, I went back to work too early (yes, everyone was right!) and it took me eight months post-surgery to be anywhere near normal but the NHS was a great employer and my friends, family and colleagues at work supported my journey. I have recently undergone another post-operative MRI. This proves that there is no increase in size of the small remnant of the acoustic neuroma. Hurrah!!! No more scans for another 6 months. Everyone was pleasantly surprised at the pace of my recovery and outwardly there is now little evidence of the surgery. Even the hair that was shaved has completely obscured my scar and I am now more comfortable putting my hair in a bun! The improvements that I noticed post operatively that allowed me to return to normal have now all slowed down. I have gone from hearing perfectly to unilateral deafness. Voices become less distinct when there is a lot of background noise. My brain does not switch off and my sleep is frequently interrupted. I now must make notes to ensure that I do not forget anything as my short-term memory works very differently. My balance has improved but is noticeably different when I am tired. I no longer feel that I am invincible and am more aware of my health and the need for a work life balance. I love being back at work and being lucky enough to have had such little post-surgical complications. This carries with it a guilt for all those who had a much tougher post-operative journey. I still manage my long lists and the education and training of junior surgical colleagues. Both as a Surgeon and as a Clinical Director, the patient experience is invaluable. It infuses everything I do and on most days. But the most important lessons are being learnt now. I will never go back to my ‘normal’ but I have had to develop a new norm. Those that know me are slowly forgetting my recent journey and I must remind them that I am deaf in one ear as they whisper to me or talk quietly in a meeting. I get tired and must pace myself and so have had to say no! I am also learning that the world is not forgiving of disabilities. In a shop recently, a woman faced me angrily and told me she had been asking me to move out of her way, in a busy shop full of Christmas shoppers. She pushed past and walked away before I could tell her that she had been talking to my deaf side! I cannot pinpoint noise and feel like I need to wear a sign that explains that I am deaf on one side. I have learnt to be grateful for the one life that we have, in which we must live, love and share happy times with family and friends. I have a new life, different to the one I had two years ago but one that I intend to live to the full. I want this for my children and their children too. So Happy Easter to you. In the next few days, let us all consider what we can do to #ChangeTheNorm and make this planet, our wonderful planet, continue to be a place where we can live long and prosper. My interview with Sovereign Magazine! I was delighted to be interviewed by Sovereign Magazine about my patient journey but also the wider NHS. Stella Vig is a Consultant Vascular and General Surgeon at Croydon University Hospital, South London. Born in Bangor, North Wales, she trained at the University of Wales College of Medicine. She was appointed as a consultant in 2006. Stella has a strong interest in training and encouraging medical students and foundation years to pursue a career in surgery. She is a champion and advocate for trainees, ensuring their voices are heard. Stella was awarded the NHS Leadership Academy London Mentor of the Year in 2015 and the Silver Scalpel Award as well as the Dr Rose Polge Award in 2018. She developed an Acoustic Neuroma and underwent surgery in 2017. We reached out to learn more about Stella’s story, the story of an extraordinary woman who had no choice but take the journey from being a surgeon to become a patient and survivor. You brand yourself as an NHS Enthusiast and Survivor. What was your recent experience as a patient? Luckily, I had an Acoustic Neuroma, which is a benign brain tumour. I can remember realising that I had a mass as I came out of the CT scanner. There was an immense relief when I found out that it was not a cancerous growth and that there was an option for surgery. The NHS was amazing throughout my journey. I underwent a CT scan rapidly and was given a diagnosis by a Consultant before I could blink! In fact, it was too quick, and I had to spend time catching up with my diagnosis and coming to terms with it. I had fantastic care both at Croydon University Hospital and then at John Radcliffe Hospital in Oxford. My surgery took over 12 hours but was uneventful. My Surgeon explained that it would take 6 months to recover and though I was desperate to beat these odds, it did take me 8 months to be anywhere near normal. The NHS is in dire crisis right now and as a healthcare professional you have experienced both sides of the NHS. Stripped of who you are as a mother, friend, wife, and NHS Professional, what has the doctor, Stella Vig, learned from being a patient? It took a matter of minutes to convert me from a Consultant Vascular and General Surgeon to a patient. As a professional, I am aware of the funding crisis and the increased need for NHS care which is outstripping current capacity. Whilst I knew what was going on in the background, as a patient I was shielded from this everyday chaos. I was given time to talk in my appointments, my operation took place on the day it was planned, and I had all post-operative care as needed. I never felt rushed or that I was wasting valuable clinical time. The nurses, though overstretched, made me feel as if I was the most important patient every day and the physiotherapists forced me to walk, even though I did not think I could do it! How this experience impacted your values as a surgeon? This experience has reaffirmed my values as a Surgeon that the patient always comes first and you must do the right thing, first time to the best of your ability. The Surgeon was fantastic and although there was a 40% chance of facial nerve injury, I managed to escape this devastating complication, due to his skill. The honest discussion during my consultations, which were frank and informative, helped develop a strong bond of trust and faith in my Surgeon and their team. The experience has also reinforced how vulnerable a patient feels under one’s care as well as the wider impact to the family and friends. The surgeon’s role is not just to ensure that the patient is looked after but also that the family are kept up to date with post-operative care and discharge plans. What was apparent was that the Surgeon’s leadership was evident in the behaviour of the ward and more junior team. Being a Consultant Surgeon is not just about the surgical skill. The compassion and communication as well as leadership and development of the surrounding team, ensures excellence in patient care. There is a lot of frustration both with communication and compassion, not only with patients but with NHS staff. What can the NHS do to survive? The NHS is a valuable institution and the recent survey by the Kings Fund, evidences that the public still consider this to be vital to the United Kingdom. As a member of the public, we need to ensure that the NHS is used wisely. It is sad to see patients not attending outpatient appointments, tests and operations. Each of these wasted appointments costs money but also stops another patient from using this time for their own care. As a Clinician, we need to be aware of the cost of tests we order and practice evidence-based medicine. There is a constant need to innovate and to challenge ourselves to deliver the best care in the most efficient way possible. Politicians are aware of the crisis that is developing within the NHS, mental health and social care. The current promise of £20 billion is needed immediately to avert capacity issues but this must be spent across all the sector. The ageing population has not yet soared as the post war baby boomers are still young at 70 and intend to live well into their old age. There is now an increasing need not just for health care but social care as the family networks have disintegrated increasing the need for government aid. The need for investment is not just cash based. The NHS has long survived on the goodwill of altruistic staff, but the removal of NHS bursaries and the Junior doctor contract discussions have developed a major chasm in the NHS culture. Investment is now needed in developing the NHS workforce of the future. You are known for your contribution as an educator. How important is education in the work place? Being an educator, mentor and trainer, brings huge rewards. The small daily investments in your future colleagues across the multidisciplinary field soon causes major ripples. Once one has invested in you, you feel duty bound to invest in another. This circle of kindness, care and interest in the work place creates an atmosphere that engenders innovation and a wish to try without recrimination. This is the culture that needs to permeate through the NHS but sadly is still only palpable in small pockets. You received The Dr Rose Polge Award. While a doctor never chooses to be ill, is anyone prepared to give them a chance whilst they are struggling with their own mental health challenges? Receiving the Dr Rose Polge award was humbling. Dr Polge’s death was tragic both for her family as well as the NHS. We need to look after each other and this just takes an investment of one’s time and a passion to nurture. If just one trainee reaches out, then this is worth it. There are very few ‘Difficult Trainees’ and if one probes sensitively, there is always a back story to the trainee in difficulty. It is important that the culture supports the notion that no one comes to work to cause harm or intends to become ill. Doctors are human and have the same life challenges as everyone else. Bereavements and family circumstances may cause an individual to become the sole bread winner whilst managing a taxing career. Illness may creep up slowly without an individual realising the effect on their work. Support and understanding at this difficult time allow a doctor to return to their profession in some way that allows them to succeed. The NHS is supportive of health and well-being, but services remain stretched as the NHS becomes more and more challenged fiscally. There is still a long way to go to eliminate not only the stigma of current mental illness among the medical profession but raising awareness for their well-being. It is a global epidemic and there are no easy answers. What does it take to change NHS attitudes towards doctors’ well-being? One of the major challenges in supporting doctors is the pride and stigma of health and mental illness. There is a fear that once one is labelled, one cannot return to a normal working life. It is imperative that the work place champions the idea of asking whether one’s colleagues are okay and creating a safe place for individuals to talk if they need to. All hospitals have an occupational health department and they are fantastic at signposting to services that are available. From a personal point of view, the support I have had from colleagues has empowered my return to work with an increased loyalty to the NHS that looked after me. Communication is the very fabric of the healthcare profession. For centuries people went to the doctor and told their story and the doctor prescribed a remedy based on what they heard. While this is a very basic definition of the patient- doctor relationship, do you think communication is utilised to our advantage at present? How can we use the power of words to communicate better as a patient and as a healthcare professional? The basic tenant of communication remains the story telling by the patient to the doctor. The details of the story are vital to the diagnostic abilities of the doctor but the skill of asking the right questions is still key. Underlying this is the need to develop trust to enable the story to be told without any concerns that the information will be used unwisely. As a patient, this was the key in ensuring that my treatment was a positive journey. Consultations often carry explanations of difficult concepts and details of complex management plans. These conversations are embedded in the delivery of bad or difficult news which engenders fear, desperation and the defence mechanism of denial. It is therefore difficult to ensure what is said is what is heard, whether by the patient or the professional. Listening and checking what has been heard and understood is essential to reach a common understanding. Key to this communication is the multidisciplinary team who encompass a wide variety of skills. The specialist nurses are a fantastic resource that are not only extremely professional and knowledgeable but also approachable providing care plans in a practical and long-lasting relationship. Please click here to see the entire magazine! Merry Christmas to all of you! I hope that you have found time to eat, drink and enjoy the company of loved ones and develop new memories to cherish forever! I am on call and treading the delicate balance of ensuring that any patient well enough can get home if they wish, especially if it is likely to be their last Christmas. It is always a difficult time of year. We try to get patients home but sometimes home is not the cheery warm house with the open fire, a Christmas tree and presents all around. Sometimes it is a bleak place that is lonely and cold and patients choose to present to accident and emergency to be admitted and enjoy company and good food in hospital. Others would love to go home but are hampered by the need for social care which is a scarce resource. They may need mobility aids or food delivered to home or sometimes, just someone to pop in and check they are okay. As cuts have hit, many convalescent homes have closed, which used to offer respite for patients, allowing an interim between an acute episode of care and home. The wider social network has also diminished as the societal norm of the extended family has changed with smaller family units and a desire to move to independent family homes. It seems simple that a family member could come and stay or that the patient could stay with a close relative but the interconnectivity between NHS Trusts, community and social care are so poor that it takes an age just to set up dressing changes in a different postcode location. There are therefore, patients who are desperate to go home who end up in hospital over the Christmas period despite best intentions. The desire to get home does seem to add a miracle into the medical mix as patients summon inhumane energies to get better. I wish I could bottle this up as an everyday get well potion! There is great evidence to show that a positive attitude reduces the length of stay of patients in hospital. This seems to drive the same positive gains as the #EndPJParalysis campaign. This global social movement emphasises that having patients in their day clothes while in hospital, rather than in pyjamas (PJs) or gowns, enhances dignity, autonomy and get them home quicker! The lead up to Christmas has been a busy one. We have celebrated the 60th wedding anniversary of my in laws with a surprise party as well as attending the wedding of a dear friend. The 60th celebration cake was unbelievable! It has been busy at work and we have tried to say thank you to the people we work with everyday. We wrapped up 250 Christmas socks, with chocolate coins and Christmas pens! This was a small gift to say thank you but we enjoyed spreading good cheer in the Directorate! As we all start to celebrate, we have to ask what is Christmas? A holiday, a religious time or just a state of mind, where we all enjoy goodwill and mercy to each other? This year more than ever, has demonstrated the undercurrent present in our society, which engenders distrust, chaos and division. As we drive through the streets festooned with lights and holiday spirit in the air, society seems to be conjoined in ensuring a good time for all. And then there are glimpses into the alternative reality with the homeless on the streets and BREXIT looming. I write today on Boxing Day. My father passed away three years ago on this day. He died peacefully at 92 having led a hard but successful life. I am glad he is not here to see the divide that is developing in this country. He arrived in 1955 on the RMS Strathnaver and then married my Mum. Together they brought up three children and encouraged us to work and play hard! The ethos of working to improve the lives of others is embedded into all of us and we have worked hard to honour Mummy and Daddy. Daddy himself played a important role in North Wales, where as the first Asian Labour Councillor, he advocated for an investment into the fabric of Penmaenen. He has left a legacy not only in us but in Penmaenmawr. It is now hard to imagine an alternative scenario where Daddy had been refused UK entry and the three careers which add to society as well as the hopes and dreams of our children rendered null and void. This Christmas has been quiet, with only four of us celebrating, especially with my week on call. Christmas in North Wales was full of laughter and presents and was the one time when we were all at home! To the kids dismay, I am looking forward to the time when they have families and we have young children running around again! I hope that you all have had time to spend with family and friends and wish you good cheer! Last week a friend attended an important medical appointment and was told ‘Chemotherapy may not make a difference’. When we were discussing this later, my friend was still unsure whether this was because the prognosis was so good that it would not make a difference or because the prognosis was so poor… The consultation had lasted an hour! Communication and language are at the heart of the healthcare professions but we seem to be losing the art of speech and compassion. Even interactions between healthcare professionals are becoming more pressured and dictatorial in the normal working environment and the healthcare professionals, who are largely altruists, are being harmed. Trainees are asking for advice with difficult conversations and often trainers need to point out that the altercation is often not about the way they behave but rather the stress of the individual they have encountered. Losing 50% of my hearing has made me appreciate language and communication now more than ever. I watch others and find that non verbal signals fill in many gaps of a conversation as increasing background noise obscures my hearing. This observation also demonstrates the unease and dismay when hard-working professionals try their best to provide excellence within a hard pressed NHS environment but they face words used by others which clearly evidence a lack of value and respect. A factor must be the limited funding within the NHS causing undue stress and that desperate strive to do more with less. Words used as drivers are efficiency, productivity and income. Quality, safety and excellence risk being lost and we are all responsible for ensuring that these words continue to be flagged alongside the daily conversations within the NHS at every level. Is another factor the introduction of the electronic patient record into the NHS environment? Members of nursing staff now sit in ward bays on computers inputting patient observations and drain outputs. The laughter and banter, where staff and patients interacted, is still present but is a rarity as the pressures of the new safe staffing ratios and lack of workforce bite. Doctors work with antiquated computer hardware with software that outstrips the bandwidth in the NHS so that the system churns so so slowly. The doctors continue to do ward rounds and desperately try to enter the patient information on the ward round in the fewest words possible as there will be no time once the ward round finishes. Nursing staff are seldom on ward rounds as there are multiple specialities rounding at the same time. Speciality wards have long since disappeared as the number of beds within the NHS have reduced in cost cutting exercises. Gone are the days (when I qualified in 1991), where Sister would send all visitors out, in preparation of the Consultant ward round, with all prescription charts and notes made available at the end of the bed especially the x-rays in brown packets! Woe betide the house person who did not find that missing x-ray packet as that would be the only one the Consultant would ask for! There are certainly many improvements with the electronic patient records as the charts and x-rays are readily available but it is at cost of patient facing time and the art of conversation. Recently on a ward round, we approached a patient who was clearly visually impaired. As normal, I introduced myself and took her hand. I asked what she could see, as each patient has a different visual impairment. The team introduced themselves and we discussed her clinical symptoms and management plan. It was important to individualise the management plan with her due to her visual impairment. She cannot see her feet and therefore is unable to recognise the early signs of problems with her foot. In fact as her foot is insensate, all early warning signs fail. This increases her risk to sepsis with a foot infection as she is diabetic and systemic infection can take hold very quickly. The juniors asked me afterwards how I worked out that she was visually impaired so quickly as I had not met her before. To me it was obvious as she was not watching what was happening on the ward but I learnt the skill of observation and deduction from my seniors and time spent with patients. It is now very easy for the entire medical team to log on to a computer remote from the patient, review their history and clinical symptoms without even talking to the patient. A second ward round in the afternoon may assimilate blood results which completely change the direction of a clinical management plan. As this decision is taken in an office, the junior team may forget or be too busy to go back and ensure the patient and their family are aware or even more fundamentally, the nursing staff who will enact the plan. We all need to work harder in the NHS to role model the communication that you or I would wish and deserve to experience in any medical interaction. The frustration with communication in the NHS was also exemplified when my father was in hospital. Trying to find out what had happened during the day in my father’s care was a daily battle. Working families struggle to visit in ‘normal working hours’ of the medical staff and out of hours medical staff do not have the time or knowledge to address family concerns. This year at Croydon, we will try a communication board at each patient’s bed side where both family and patients can write down any questions they wish to have answered, I will let you know how we get on but if anyone has a good idea to overcome this particular challenge, please do let me know! The challenge of communication in the present day does not seem to be isolated just within the NHS. I was talking to a Black Cab driver recently whose father had recently been into hospital (and could not praise the NHS enough). He commented on the diversity in the NHS workforce and expressed his concerns with BREXIT looming on both morale and workforce numbers. As with most Black Cab Drivers, his communication style was interactive and that innate ability to put you at ease as soon as you got into his cab. He shocked me with the stories of abuse he had received, both verbal and physical during his hours as a cabbie. Despite innovation in technology, we seem to have lost courtesy and respect as a high value commodity. Community welfare has been exchanged for individual prosperity and development. Has the I replaced the We? My hope is that is has not! The world has become a much smaller place. My father travelled by ship from India to the United Kingdom in the 1950s which took weeks. Letters from my father to his family would take an age as they travelled by Airmail and then he would wait even longer for the reply. Now we email, Skype and FaceTime to stay in contact with our friends and family across the world. People have migrated across the Continents, have settled and married between different cultures and created new rules by adopting the best from both. What an opportunity to respect, value and embrace cultural norms as well as differences. Would I be viewed differently at work if I wore a sari, a suit, a dress or salwar kameez? Sadly, I think I would, despite the clothing worn by the same person. How do we teach society to be tolerant and have value and respect for all cultures? We all need to role model the behaviours that we cherish and value. We have a responsibilty to call out behaviours and words that do not attest to a society that values all. Our politicians and celebrities carry a heavy responsibility to evidence their integrity. Respect and value should be their mantra every day, every time. Society needs to make clear this is the expectation of the public. We should not ban cultural dress nor dialect but embrace and incorporate this into our multicultural world. There should be a common understanding that what is said may not be heard in the same way by others as our cultures vary. This high level communication skill should be embedded into our training programmes in all public facing services to ensure that we all hear and understand the common language. What we should all expect in return is common courtesy in an old-fashioned way. This week has seen the celebration of International Women’s Day and ends with Mother’s Day in the UK. It has been a week of highs and lows, realising that so much has been achieved but that there is so much more to do to ensure parity for women all over the world and in every career. Women and men are different, the basic difference is that we bear children. This is an amazing feat of nature and I have two children that make me immensely proud. This natural phenomenon of having children should not define us: women should be able to make the choice to succeed however they wish. My mother was a great lady and always stated that there should be no reason why I could not do what I wanted to do (just like my father!). My mother was born in India in the 1940s and lost her father when she was five. Bringing up 6 children as a single mother was a feat for my grandmother, especially when you consider that all six children were university educated in a system where you pay for your education. My mother was caught up in the atrocities when India and Pakistan separated and the whole family moved from Rawalpindi to Ludhiana. She walked with her cousin, crossing the border, seeing killings at first hand, surviving but never forgetting that time. She never really talked about it but just filled up with tears and so this topic was seldom brought up again. She had wished to do medicine but as one of the oldest had to qualify and start earning, to help put her younger siblings through university. She mastered in politics and geography and rapidly became a Headmistress of a school in India. My father had moved to the UK and settled in North Wales, finding the people welcoming in Penmaenmawr. In 1965, he returned to India to visit his mother and an unexpected arranged marriage meant that my mother left her fantastic job and returned to the cold, isolated village of Penmaenmawr, with no friends and no job! She tried to break into the teaching system in the UK but her qualifications were not recognised and all the possible jobs were in Birmingham or London. She became pregnant with me in the second year of marriage and never taught again. My mother spent her life working hard alongside my father developing skills that she could not have dreamed of doing in her life time. They refurbished a four storey house, developing this into a guest house and shop. My mother learnt to wall paper, put up polystyrene ceiling tiles, paint and sew curtains. They opened a successful shop, named Wonderland in Penmaenmawr, when holidaying to the North Wales coast was the way to spend your summer! My mother became a stock taker, saleswoman and continued to be a great mother. She worked on the markets with my father, supporting him and innovating the business. She put three children through school, embedding a culture of nurturing, success through education and responsibilty in all three of us. She loved people and ensured that all our friends were welcome and always well fed and is always remembered for this! At every stage, when I questioned how I would achieve, she would encourage and just tell me to get on with it! This included my mad decision to become a Surgeon. I was appointed as the first Calman registrar in Wales and worked hard, delivering 101%, ensuring that no-one could say that I was not up to the standard required. I had two children and returned to work at 12 weeks on both occasions as I did not want to let the team down, but also because I did not feel that I could take any more time away from work. There was no overt pressure to do this but the culture of surgery embedded this internally as there were no other women around me having children and a career in surgery. I was lucky to have supportive colleagues and although there were highs and lows in training, remember this time as hard work but enjoyable. Just this week, I met up with four previous colleagues from Wales, four of us had worked together as juniors with our Senior Registrar and we came back together on a course. We remembered our time in Wales with happiness and all three females had felt encouraged by our peers. In the background of this picture you will see a painting that hangs in the Royal College of Surgeons of the Court of Examiners. What is striking is that although many of our old bosses are portrayed in this beautiful painting, that they are white and male! it is hard, a job for the boys, requires sacrifice of motherhood and a relationship, sacrifice of a social life amongst so many others. These myths need to be dispelled as all jobs are hard and one does not become barrister, fashion designer, pilot, a success in business without hard graft. This is no different in Surgery and the difficulty is not based on gender. What shocks me is that when we have had female Prime Ministers, Heads of Police and Fire Service, Presidents of Colleges, Chairs of Education and Business, female medical students continue to believe that a successful career in surgery is not achievable. The Twitter campaign #ILookLikeASurgeon showed how women are great surgeons and combining all facets of their life with this ambition. Surgery is open to all and it is our responsibilty as the Surgeons to welcome medical students and foundation trainees into our daily lives, encouraging them by valuing them and supporting their career decisions. The Royal College Women In Surgery held a successful evening on International Women’s Day this week, where many myths were dispelled by male and female role models. Professor Farah Bhatti is the Chair of WINS and is a great role model. There are now increasing women in the Court of Examiners, as Chairs of JCST, members of College Council and this is much welcomed. A culture where the belief that the sum of the whole is much more that the individual parts is all encompassing. These are values that need to be embedded into Surgical Training but also into the NHS as a whole. The recent suggestion that NHS staff may achieve a 6.5% pay rise but at the cost of losing annual leave to balance the pay bill undermines the above culture. Unless there is a dramatic and rapid turn around in the value and belief in the NHS workforce, we will continue to lose amazing individuals that will innovate and advance our healthcare system, which has so far been lauded across the world.